In her first New York solo show, Elizabeth Neel brings a force, an aggression, to a series of oil-on-canvas works. The paintings, based on imagery culled from the Internet, is boldly dismissive of distinctions between abstraction and representation. Landscape and figure grow out of abstraction, and at the same time, decay into abstraction—an abstraction that represents not so much the geometry of forms as the insanity of perceiving. In this new millennia of painting, Neel has distilled a methodology as fully cognizant of digital imagery and the position of the cinematic camera, as it is of the course of art history. “Every painting I make is a reference to every painting made before,” says Neel. In the early twentieth century, the idea that art could be something other than framed pictures of fleshy women or green panoramas or biblical tableaus, was beyond the customary understanding of what art could be. It would be insanity to find a toilet, or a coat rack, and call it art. Towards the middle of the century, the notion that art could be found on the cartoon page seemed equally preposterous, similarly, pop culture would make its surprising contribution. The next trash heap is often where we find the future—where insanity collides with creativity. Following in this trajectory, Neel forages on the Internet, which represents, to most, an artless amalgam of stuff. The assumption that figuration was outmoded was widely held for many years—a notion that Neel challenges with the ambiguity of her own relationship to the categories of abstraction and representation. The work, while straddling the two camps, is also completely its own, and explosively inclusive. 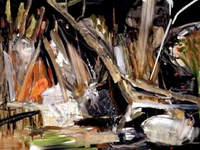 Her deft brushwork and acumen embody a historical perspective, as well as a historic presence.